Your CRM area of Karbon. Manage all your company contacts, whether they are clients, they are entities and/ or their relationships. 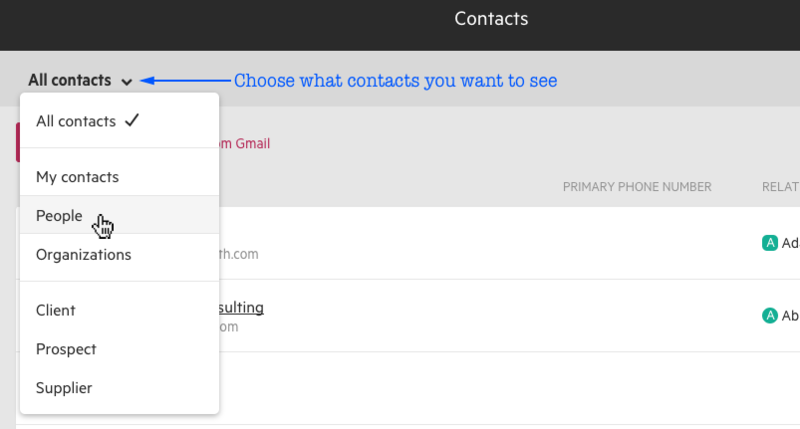 On your Contacts page, you have the ability to view, filter and search your contacts. People, organizations and client groups are each represented by different icons. You have the ability to filter on people, organizations, client groups, as well as My Contacts—contacts who you're the Client owner for or you are a member of the Client team. In addition, you have the ability to filter by contact type. Each contact has a timeline, work and details tab to make it easy to keep track of all your client relationships. Timelines bring together all your communication in one place. It's a great place to store notes for summaries of phone conversations or face to face meetings. Timelines help you and your team stay up to date on the latest communications happening among your clients. All work for contacts and organizations are captured on their respective timeline. You have the ability to sort and filter information based on your preferences. The details tab gives you visibility into contact information as well as other sorts of information stored on the accounting details tab. For an in-depth look at contacts, here's a video overview of Contacts.